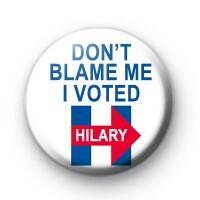 This is a listing for a 1 inch button badge with the Political slogan 'Don't Blame Me I Voted Hilary' USA Election 2016. Not Donald Trump. America Political race to the White House November 11th 2016.